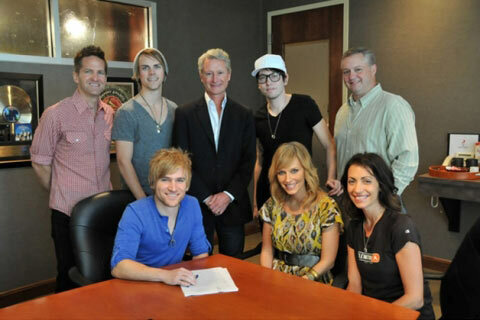 Photo (L-R, standing): Blaine Barcus, VP A&R, Provident Label Group; Chris Brown, Elevation Worship; Terry Hemmings, President & CEO, Provident Music Group; Mack Brock, Elevation Worship; Scott Knight, VP Business Affairs, Provident Music Group; (L-R, seated) Wade Joye, Elevation Worship; London Gatch, Elevation Worship; Holly Zabka, Senior Director, Essential Music Publishing. (NASHVILLE, Tenn.) Oct. 18, 2011– Elevation Worship, a Charlotte, N.C.-based worship team from one of America’s fastest growing churches will release its national debut album, For The Honor, on Essential Worship November 22. Worship leaders Wade Joye, Mack Brock, Chris Brown and London Gatch lead Elevation Worship and serve full-time at Elevation Church in Charlotte, N.C. The church, established by Pastor Steven Furtick, launched with eight families and one massive vision to reach people far from God. In fewer than six years, Elevation Church has grown to more than 10,000 people at six locations across the Charlotte area, making it the second fastest growing church in America. Pastor Steven is also becoming one of the most influential leaders, speakers and authors in the country. Additionally, a digital deluxe version of the album will contain 3 bonus songs, 5 music videos, For The Honor documentary, chord charts for all songs and more. As with recent movements including Hillsong, Passion and Jesus Culture, Elevation Worship seeks to bring new ideas to the worship arena, connecting with other worship leaders as well as churches to better serve God and His Church through worship.